Take the new Glenwood Gondola to the top of Iron Mountain and experience western Colorado's #1 must-see attraction...Glenwood Caverns Adventure Park. It is the nation's only mountaintop theme park and the most affordable day of fun in the Rockies. You'll find a host of activities for kids of all ages along with amazing educational activities. 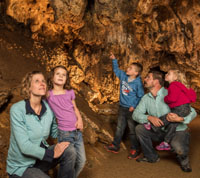 Glenwood Caverns and Historic Fairy Caves are a natural wonder, rated one of USA Today's "Top 10 Family Cave Tours." Mountain-top restaurant...huge views. Get it all with the Funday Pass. Buy online and save at glenwoodcaverns.com. Open year-round. Go to website for seasonal hours.